Shabby chic is everywhere. This modern-vintage style dazzles and inspires people everywhere, and is now the decor trend of choice for older and younger people alike. The style is a perfect mix of subtle and ostentatious, comfortable and ornate, modern and vintage. The main elements needed to achieve a shabby chic decoration are neutral, often pastel colors, ornate yet distressed furniture, and functional yet informal sitting pieces. Mirrors and chandeliers are also a must-have, but they need to be old-fashioned and over-the-top in order to fit the trend. There are many ways to achieve a shabby chic decoration, and the DIY route is among the most popular ways to go about it, as you will see in this article. 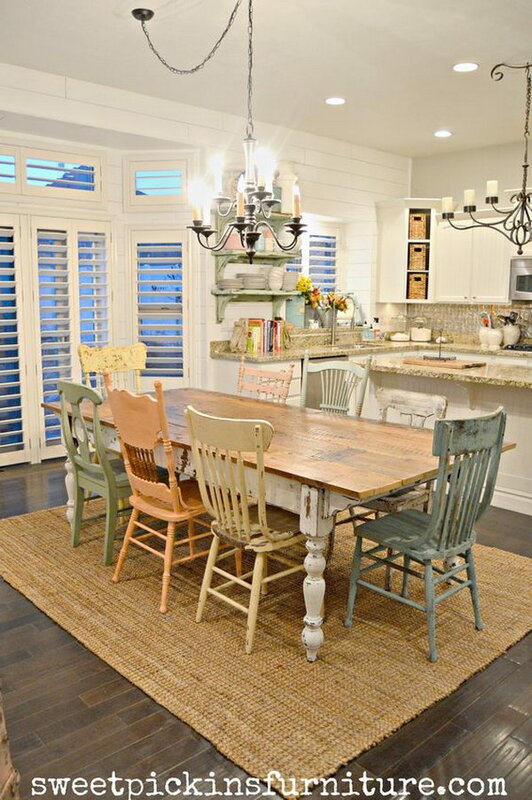 Wooden furniture gives a cozy and rustic appeal to the room, which is something that fits in perfectly with shabby chic, as do the mismatched chairs, since they add to the salvaged and lived-in concept. 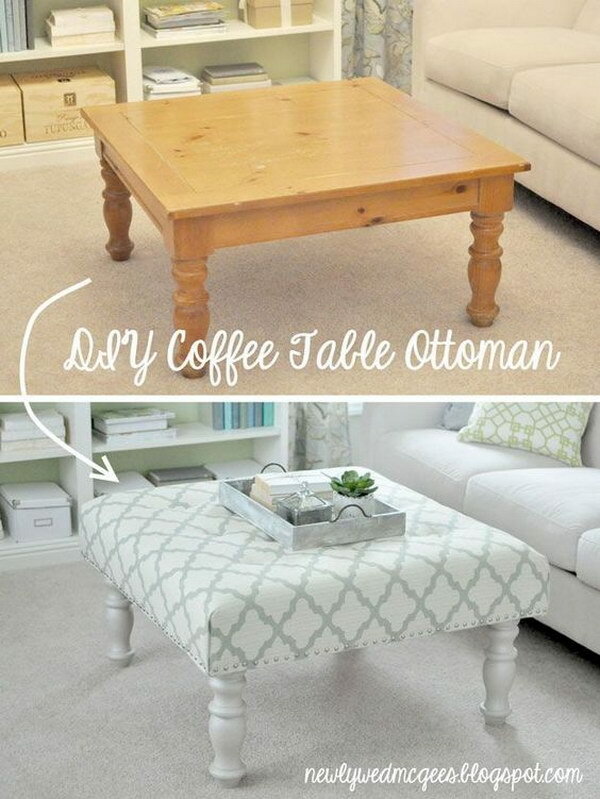 Get the tutorial via sweetpickinsfurniture. 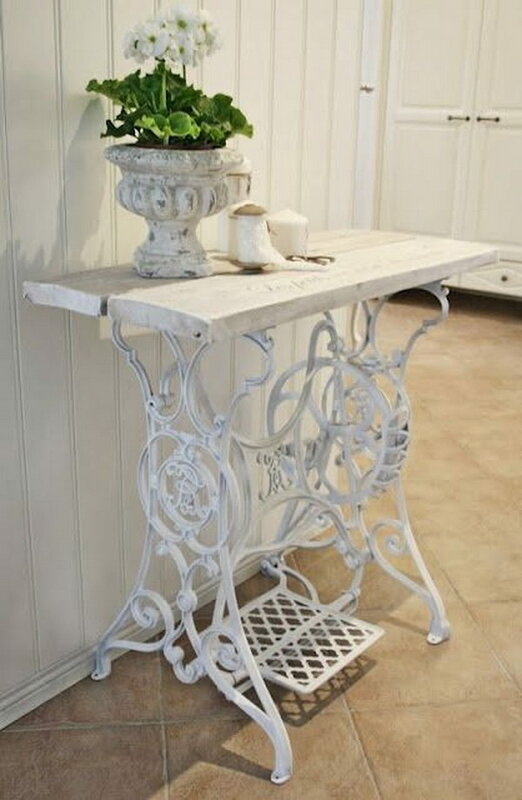 It doesn’t get much more ornate than silver and lace patterns, and ornate is a key feature of shabby chic décor, so this project is perfect to add a finishing touch or repurpose old furniture. It doesn’t hurt that it is relatively easy and affordable to do as well. Get the tutorial via uniquelychicmosaics. Get the tutorial via confessionsofaserialdiyer. Get the tutorial via thekimsixfix. This stool is a perfect example of a shabby chic makeover. While the old wooden stool would have worked too, the added rosette cloth gives it the ornate element that makes it truly shabby chic. Get the tutorial via confessionsofaserialdiyere. 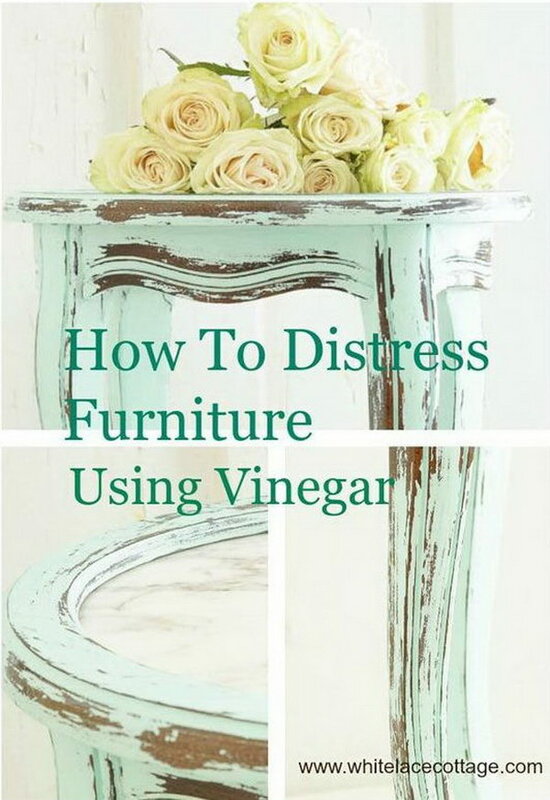 Wood always works with shabby chic, except when it looks brand new, so it needs to be distressed in order to get that lived-in feel and character. In fact, this kind of project is actually really popular among shabby chic fans, so don’t be afraid to go all out – it will look much better in the end. Get the tutorial via creativesavingsblog. 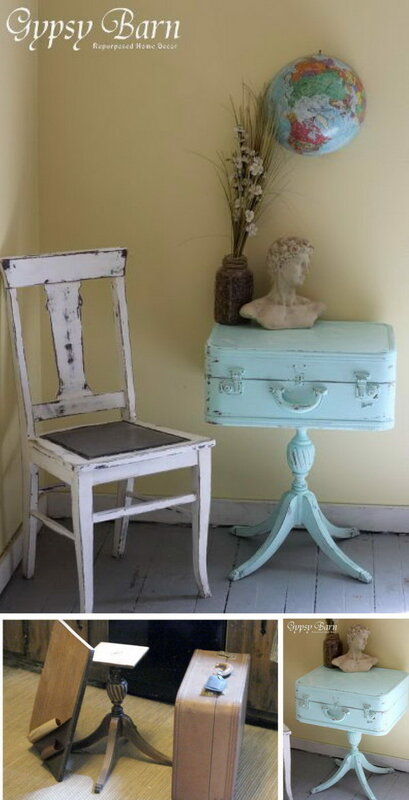 Turquoise color is also a big part of the shabby chic style, and it work particularly well with vintage-looking pieces such as these. The best thing is that achieving this look is as easy as finding the piece. Get the tutorial via hometalk. 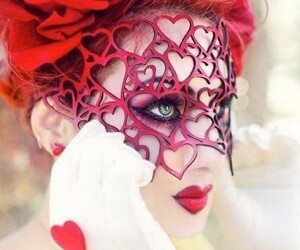 Get the tutorial via chateaudefleurs. 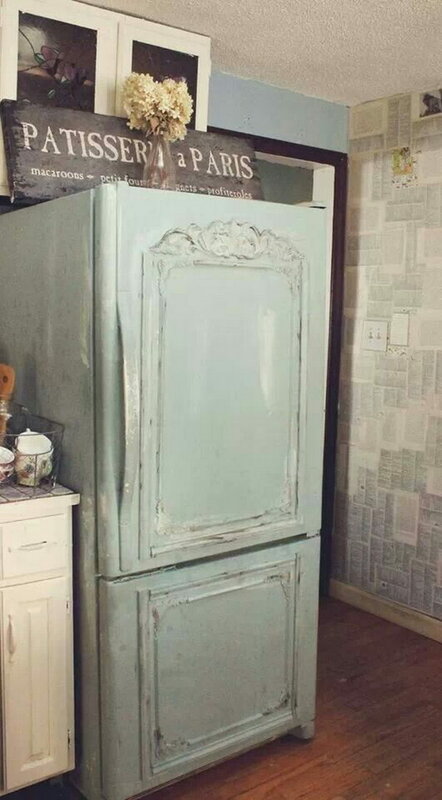 This is probably one of the most beautifully original refrigerators you will ever see. The Parisian vibe was achieved to the max, and the effects almost make you forget the actual utilitarian nature of the piece. Get the tutorial via troispetitesfilles. This chalk painted mirror is really spectacular. Get the tutorial via sincerelysarad. 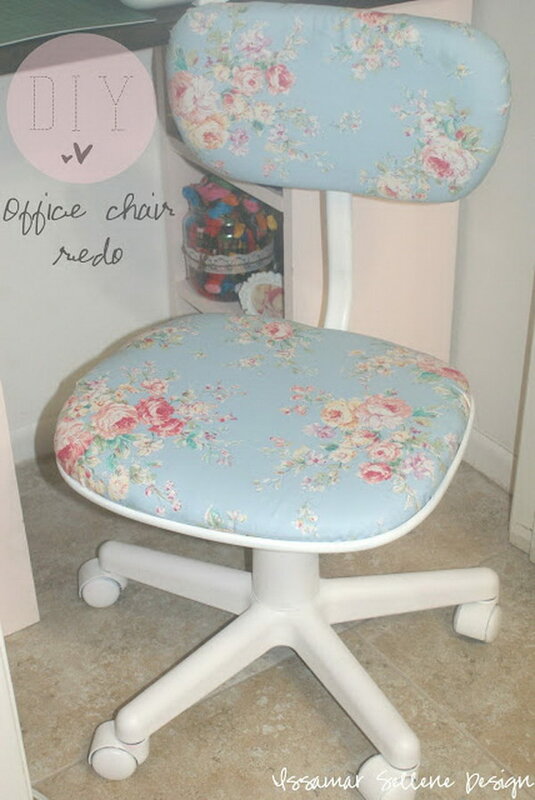 Office chairs are usually modern and impersonal, so adding the floral pattern really brings an element of shabby chic to the piece and makes it a much better match for the space. All you need is a cute floral fabric, spray paint, and a chair. Get the tutorial via issamarsellenedesign. Get the tutorial via facebook. Lamps and light sources are essential in a shabby chic room, but simple, modern pieces just won’t do. This project may be a little time-consuming, but it’s simple enough for the difference it will make in the end. 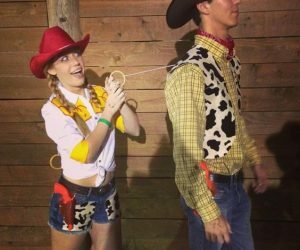 Get the tutorial via jenniferciani. 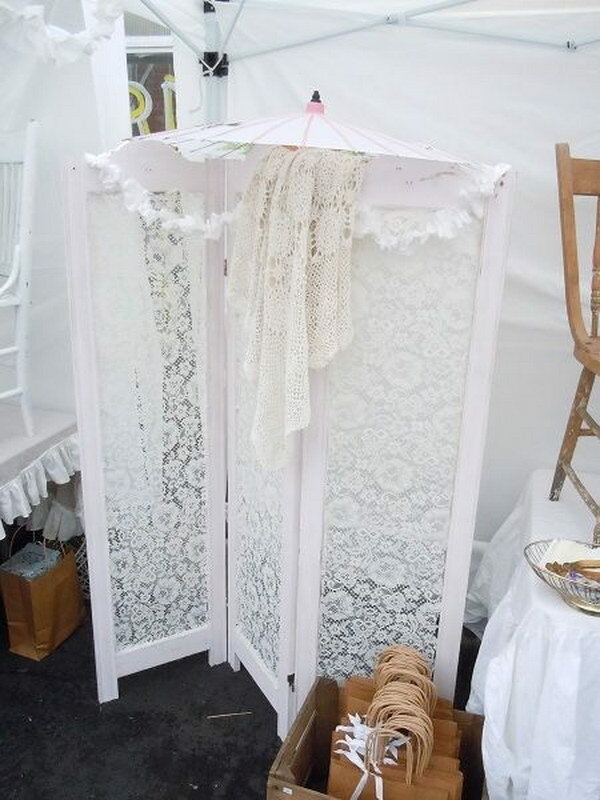 Lace is another shabby chic essential, so this is a perfect t addition to any so-called shabby chic room, even if it isn’t as practical as modern alternatives. Get the tutorial via source. 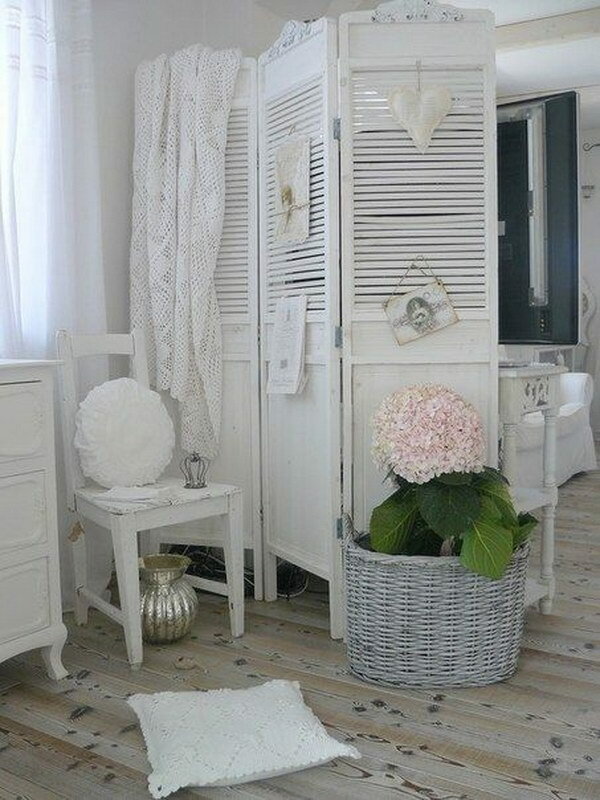 Recycled and upcycled pieces are one of the trademarks of shabby chic style and these shutters have the perfect look, so they work really well as a room divider in this shabby chic setting. Get the tutorial via source. The ornate entry way table is beautiful and chic, and all the complementary pieces really add to the look. Get the tutorial via farmhouseporch. 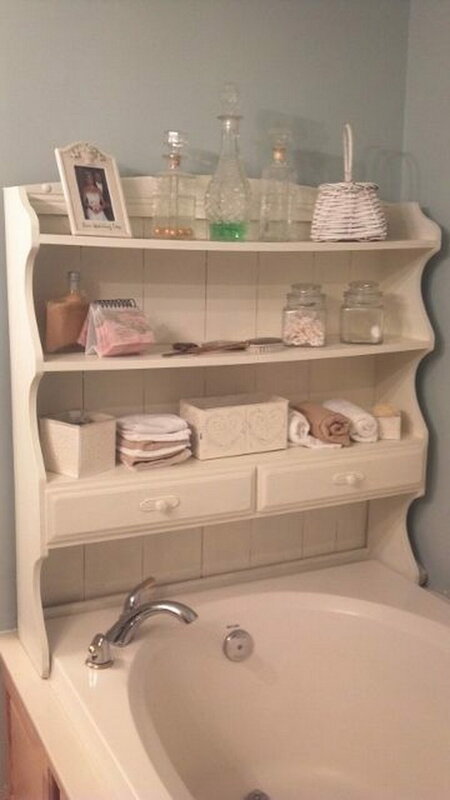 Again, this bath shelf project is a real shabby chic role model. It looks truly beautiful and shows all of the potential housed in upcycling projects. Get the tutorial via stylefromthesticks. 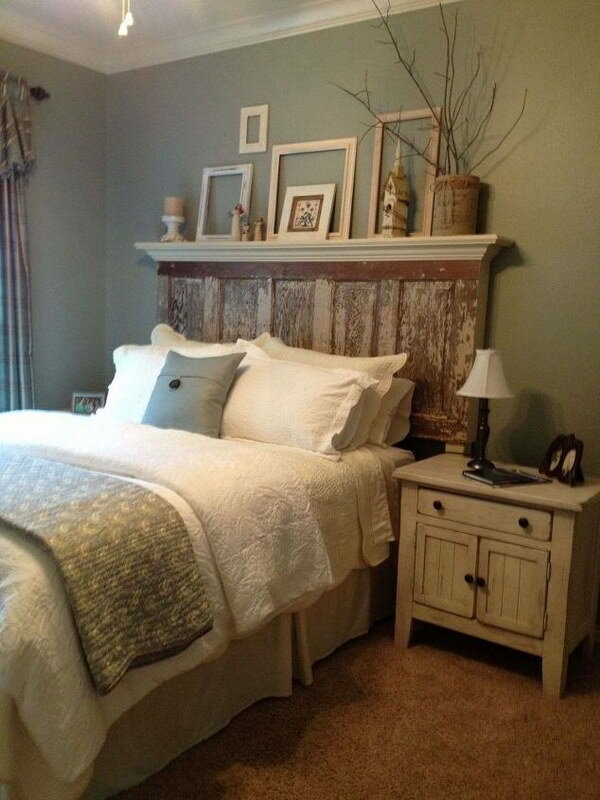 It doesn’t get any more DIY or shabby chic than turning a distressed door into a headboard. This project is so perfect you can barely tell what this beautiful frame used to be. Truly magic. Get the tutorial via hometalk. 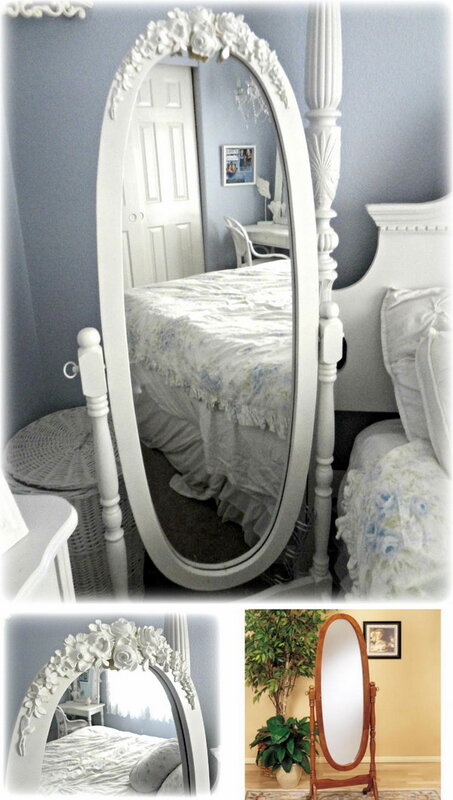 This mirror is the epitome of shabby chic, so if you want to replicate it, all you need to do is find an old plain mirror and use wood glue to attach the appliques to it, then paint them the same color you like, it really makes a drastic change. 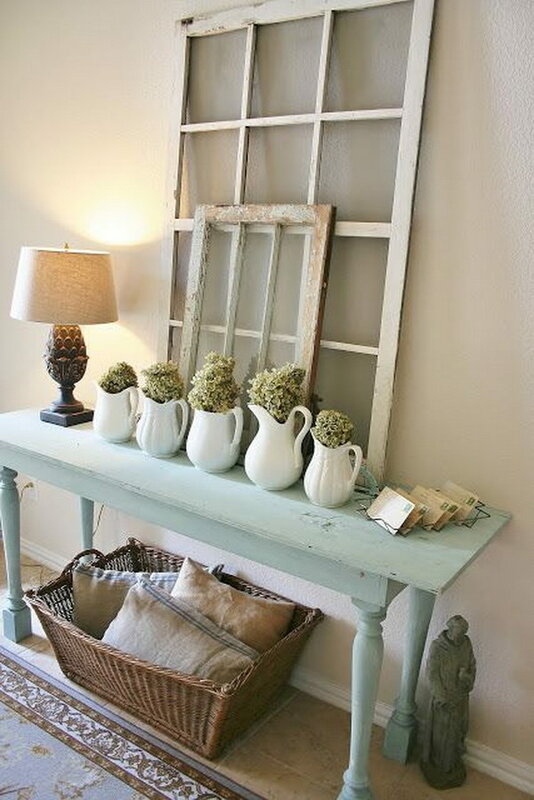 Get the tutorial via notsoshabby-shabbychic. 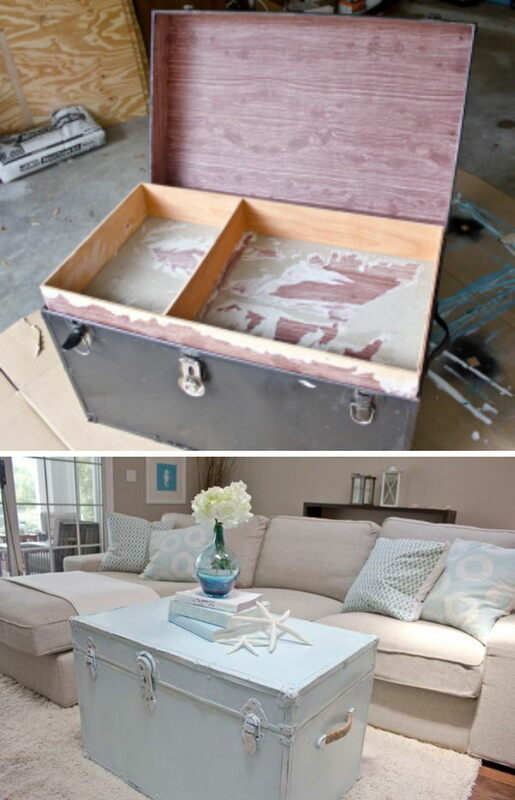 This is another upcycling project that looks truly magical. 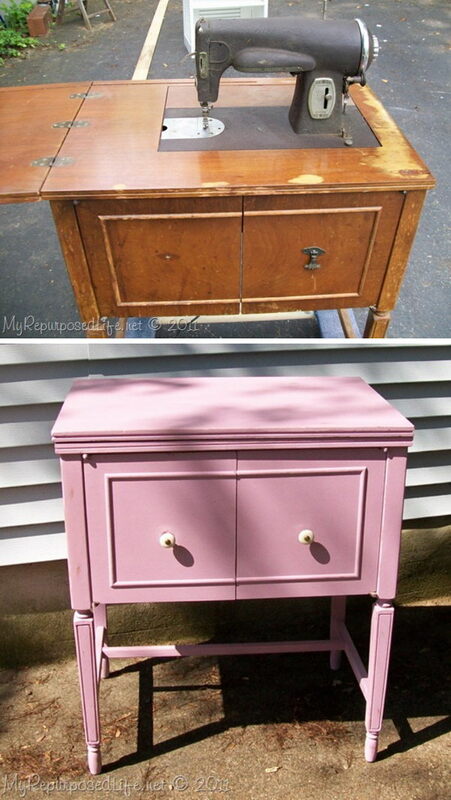 Would you have imagined this dresser was originally dark and clean-cute by looking at its pink floral magnificence? Get the tutorial via shadesofblueinteriors. These storage units were as modern and industrial as can be, and they only really filled the shabby requirement. After the makeover, however, they are a true shabby chic dream. Get the tutorial via shabbyartboutique. A sewing machine table– especially one as detailed as this – will always have a vintage appeal, but old isn’t chic, and this one definitely benefitted from being upcycled and gaining a new life. Get the tutorial via lushome. This suitcase had definitely seen better days, but after a paint job and new lining, it can really turn heads, whether it is used as a storage piece or for its original function. Get the tutorial via shabbyprimdelights. Get the tutorial via ourfairfieldhomeandgarden. 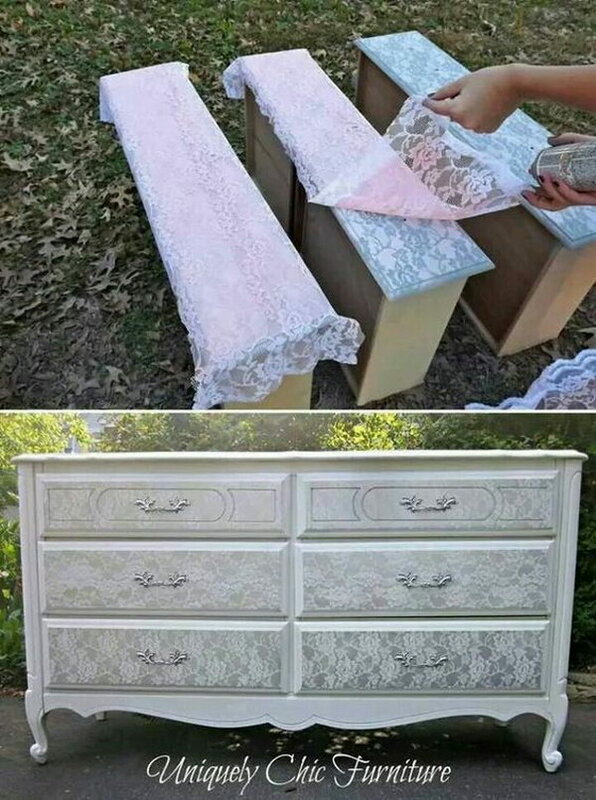 These drawers look beautifully charming as side tables, and show a real kind of out of the box’thought that is truly the essence of shabby chic. Get the tutorial via facebook. Speaking of thinking outside the box, these shelves made from a ladder are not only beautifully chic and pastel but also something you will not find anywhere else, unless of course you replicate it yourself. Get the tutorial via makingitinthemountains. This night table was definitely chic, but also quite old-fashioned. The new pastel hue and distressed look gave it a new life and charm it had definitely been lacking. lizmarieblog. This ottoman was beautiful, but looked too new to be shabby chic, so it was painted and covered with patterned fabric to make it look truly vintage and elegant. Get the tutorial via newlywedmcgees. add to a plain ladder back chair to fancy it up. Get the tutorial via junkchiccottage. The jewelry organizer you see here is the essence of shabby chic, from the repurposed ornate frame to the lacy shelves. 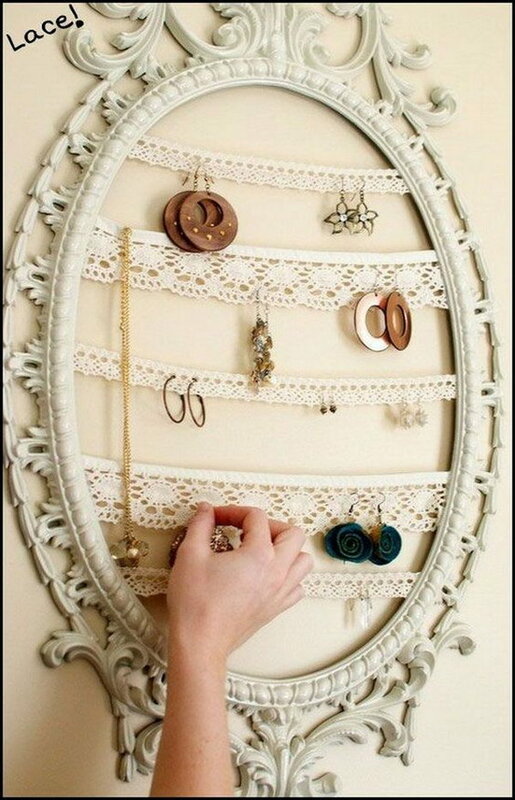 String lace in an old picture frame to create an awesome jewelry holder. Use holes in lace to organize earrings. Get the tutorial via decor4all. 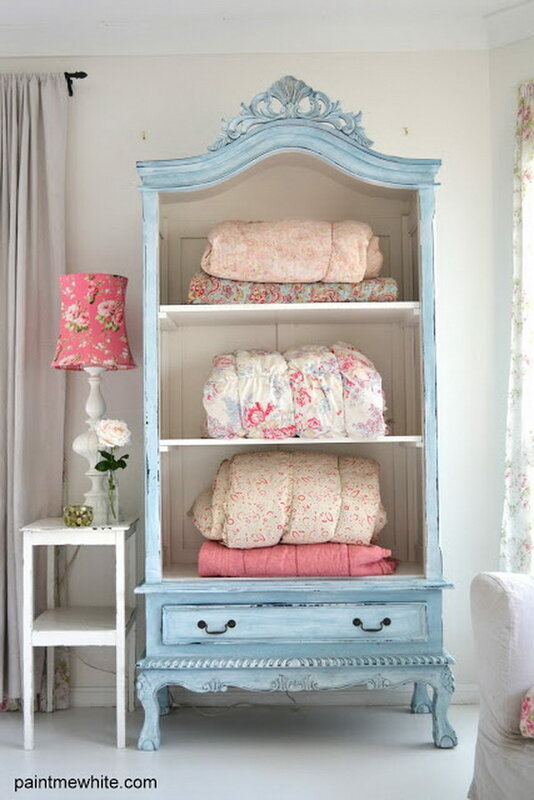 This cabinet was truly vintage and shabby, but the makeover made it feminine and chic, perfect for a dreamy room decor. 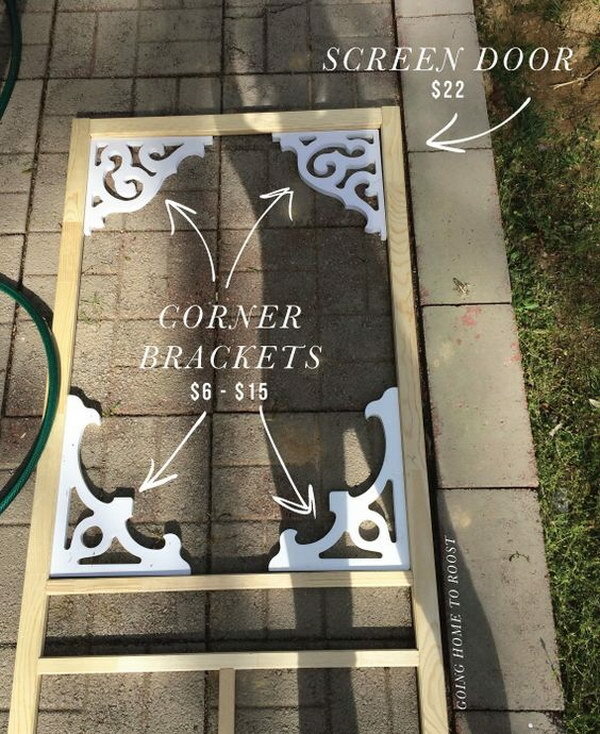 Get the tutorial via myrepurposedlife. Rocking chairs are true classics, but this one looked more rustic-vintage than shabby chic. The new color gives it a new look while maintaining its essence, and that’s exactly how it’s supposed to be. Get the tutorial via prodigalpieces. Get the tutorial via tinkeredtreasures. Get the tutorial via goinghometoroost/a>. 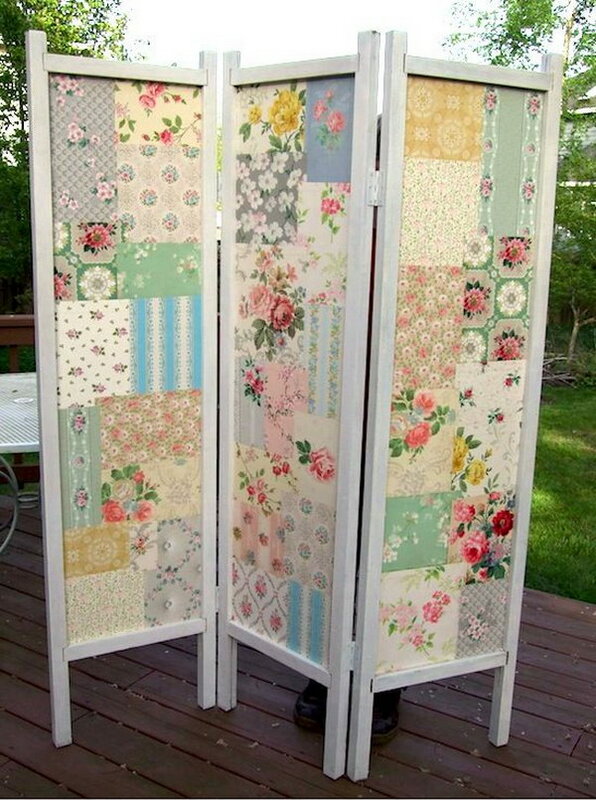 This beautiful, floral folding screen is reminiscent of ancient panels, and it’s a truly charming and chic addition to any room, whether it is shabby or not to begin with. Get the tutorial via athingforroses. Transform the beautiful armoire from black and yellow to gorgeous french blue, which give it french scandanavian feel. Get the tutorial via keepinitthriftyandrea. Super simple DIY beadboard cabinet – a great idea fo a shabby chic living room, kitchen, dining room & so much more! source. Get the tutorial via jennasuedesign. 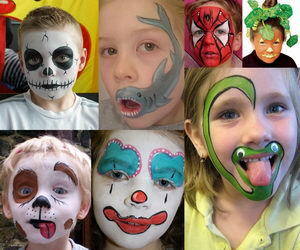 Every one of these ideas are awesome and doable! 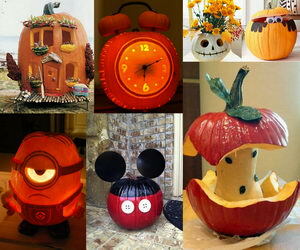 So many creative and lovely ideas! I definitely will try some of them! Thanks for these cheap and easy upcyceling tips!